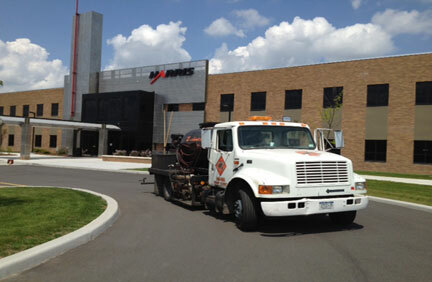 Asphalt pavement begins to deteriorate as soon as it is placed. When asphalt is exposed to the weather conditions such as ultraviolet rays, rain water, oxygen, road salt, heat and extreme cold, it reacts by expanding and contracting. This expansion and contraction causes the common stress cracks and potholes. Ultraviolet rays from the sun dry out the tar, breaking down carbon bonds in the asphalt. This leads to the "alligator effect". Often when a surface reaches this point of deterioration the damage is irreversible. This would make it necessary to repave or patch your lot. When a surface is cracked and has potholes rain water can cause damage. The rain water begins to penetrate the asphalt weakening the sub-base. A weak sub-base leads to overall surface weakness, inviting more cracks and pot holes. Here at Upstate Asphalt we service commercial properties using the necessary equipment for each job including hand and spray applications. Our hand applications are applied in those areas that require detail which are carefully applied by our employees to ensure your driveway is sealed with perfection. 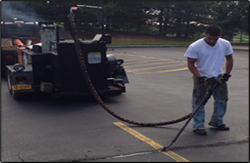 When working with the larger commercial areas we use top of the line sprayers to ensure your lot is completed with precision. It is inevitable that wear and tear will occur on your pavement due to weather conditions and driving which will cause cracks. The process of hot crack filling can be done to fill the cracks and prevent further issues. 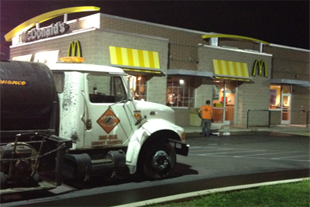 This process should be followed by asphalt sealing.